Celina Tent may have found itself under the bigtop after receiving an indefinite contract with the U.S. Defense Logistics Agency. According to a news release from the U.S. Department of Defense, Celina Tent was awarded a maximum $120 million fixed price contract for shelters to be used by the Army, Navy, Air Force, Marine Corps and federal civilian agencies. "This is opening up new doors," owner Jeff Grieshop told The Daily Standard. Although several manufacturers were awarded contracts for this work, Celina Tent will get the first order to start producing. Grieshop said he is currently waiting for a national stock number, or in other words, until an official order is placed. But once that order comes in, Grieshop said the business will be ready and will hire more personnel. The tents will help replace the government's military supply of shelters depleted by recent national and international natural catastrophes, Grieshop said. The government accepted bids from contractors last January. Grieshop said he didn't know his business, located along state Route 29, was accepted as a contractor until a newspaper recently called asking for an interview. Grieshop said the company will manufacture 16-by-16-foot shelters that will be used for various needs. He added that the tents are strong enough to serve as technical tents for the military. The company also will have to change its manufacturing process to be eligible for the contract. Because The Department of Defense requires that all products and machinery used in the manufacturing process be American-made, Celina Tent will have to purchase robotic welders. According to Grieshop, his company -- like most other tent manufacturing companies -- imports its fittings, the connectors that hold the tent together during completion, from China. Therefore, Celina Tent will use robotic welders to produce their own American-made fitters. The company now is looking to expand its personnel by hiring more skilled professionals, such as accountants and engineers. 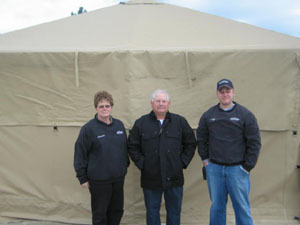 Grieshop, who owns the business with his mother, Janice Grieshop, earlier this year sold the tent rental division of the company to Gary and Joyce Rose of rural Celina. The rental division was sold so Celina Tent could focus solely on making tents, tarps and vinyl-related products. The business started from the family garage at the Grieshop's Fleetfoot Road home as a tent and party rental shop and has undergone four expansions. The business also was under the ownership of another son, Doug Grieshop, who died last year. The company now has tents all over the world, since being awarded a previous contract from the U.S. government for tents used at U.S. embassies in South Korea and Guatemala.